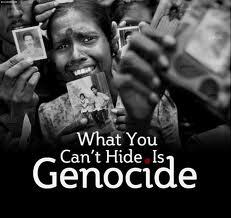 Last week I was very curious about the genocides in history. Which was the worst reported genocide in history? After much research the answers have been found! The worst recorded genocide was in China under the orders of Mao Ze-Dong in 1958-61 and 1966-69 where he killed 49-78 million. Jozef Stalin is in second place with 23 million in the USSR in 1932-39. Adolf Hitler is in third in Germany in 1939-45 with 12 million. These numbers are very staggering, as well as shocking. Most people consider the Holocaust to be the worst genocide in history, when in fact it comes nowhere close to being the worst. This past week in Ethic’s Class, we spent a lot of time talking about bravery and heroic imagination. We finished The Ghosts of Rwanda and began to discuss the “Tank Man”. All in all it was a very interesting and informative week! 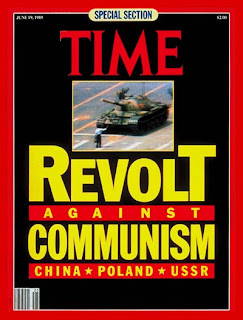 I think that the most interesting part of the week was our discussion of “Tank Man”. Before this class, I had never heard about the story! I am very glad that we covered this, or else I may have never found out! 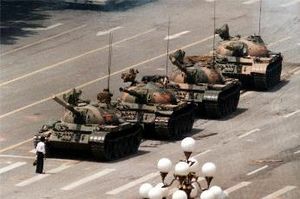 I cannot believe the astronomical amount of bravery and courage that one man had to stand up to those tanks. I am also equally surprised that the operators of the tanks did not run him over! They only tired to go around him until “civilians came and took him away”. All in all, I think the whole situation is kind of fishy, but I truly admire his bravery. I do not know many people in this world that would be able to do that! We did briefly discuss the fact that “Tank Man” was never identified, but we never discussed anything else. After doing a little research, I found that the British tabloid the Sunday Express named him as Wang Weilin, a 19-year-old student. Weilin was later charged with "political hooliganism" and "attempting to subvert members of the People's Liberation Army." This claim has been rejected though by Internal Communist Party of China documents, which reported that they could not find the man. One party member was quoted as saying, "We can’t find him. We got his name from journalists. We have checked through computers but can’t find him among the dead or among those in prison." Numerous theories have sprung up as to the man's identity and current whereabouts. The rumors now say that the man is now living in Taiwan. After all of this talk about “Tank Man”, I am very curious about what other people think. What was the response of other citizens in China?